LAFM: How many years have you been coaching? At Covington High? I have been coaching for 17 years. I have spent 13 years at Covington High, and last year was my first year as head coach. LAFM: Where did you go to high school? LAFM: Where did you go to college? Did you play football? I went to Nicholls to play baseball. I wasn’t very big so baseball was a better fit for me in college. I finished at Southeastern Louisiana University in social studies education. LAFM: How did you get into coaching? I guess I grew up around it. My grandfather [Jack Salter] was head coach at Covington High for 32 years. I always grew up around football, and I always saw that my grandfather took so much pride in seeing former players and their return. It just seemed like a very rewarding profession. 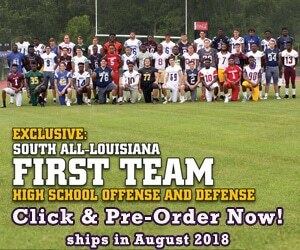 LAFM: Do you think the brand of Louisiana football is different than anywhere else in the country? I think it starts with the communities. We are all so fortunate. The communities in our state love football, and we get so much support. They want to get out there and be a part of it. There are only a few states in the country that are as gung-ho as Louisiana. We certainly produce some great players on a college and professional level. The caliber of play in Louisiana is second to none. LAFM: What advice do you give to students in regards to the recruiting process? I think it’s key just not to get too wrapped up into it. All of that kind of stuff works itself out. Putting in the effort academically, in the weight room, and away from the field will make the recruiting process take care of itself. What matters is what these players do on Friday nights. Don’t lose the experience of playing alongside the people you have grown up with. High school is the only time you get to do that. Once you get into college everything changes, so don’t lose the memories. LAFM: On either a professional or college level, who is your favorite coach? Professionally, my favorite coach is Tony Dungy. College-wise there’s so many good ones, in all honesty mine is in basketball, Coach Mike Krzyzewski. I think the class that they coach with and their personal skills are key. I think they’re really in it for the kids and their players. They’re good people. I love the way they run their program, and the kids come first. After that, the wins and losses take care of themselves. LAFM: What makes Covington High a great school and a great football program? The community. We are very fortunate, we are a small town but we are obviously growing. The alumni are still around and still prideful. When we made our run in the playoffs last season it seemed that the town shut down. We have a lot of hard-working good kids from good families. We also have a supportive faculty and administration, I could not ask for anything more. LAFM: What are you looking forward to about this upcoming season? Each and every game. Every game is a new week, a new chance, and a new opportunity. I’m looking forward to week one and seeing where we stand. We lost some really good players, so it’s the new guys’ turn to make a name for themselves. I’m excited to see these guys play. LAFM: Who are some great players you have coached? Last year we had some great ones. Garrald McDowell who is currently at Ole Miss. Otha Peters, who played for Covington a few years ago, is with Arkansas [Razorbacks]. Both McDowell and Peters were All-Americans. We have a young man right now, Otis Jacobs, who has a chance with the Baltimore Ravens. He just graduated from Texas A&M and started training camp over in Baltimore this week. We have had plenty of other good players, so we are really fortunate. LAFM: What is a key characteristic in some of your great players? Pride in themselves. All three of those guys have had pride in themselves and in their teammates. They were very unselfish and led by example. They work hard in the classroom and the weight room. All the things you would want a leader to have, they have. They were fortunate to get a chance at the next level. LAFM: What game are you most excited/nervous about? Week one we play Holy Cross. We have so many good teams on the schedule this year. I would be foolish to look any further than week one. LAFM: What do you think the Covington High football program needs to be successful this season? We need to stay healthy. We have some good players, and some good young ones coming up behind them. We lost some very experienced players, and we need our guys out there leading the team by example. LAFM: Who are some of your current players that you think could be break out players this year? Strong safety George Brister and Wide Receiver Cordara Laurant are both 3-year starters and have done a great job for us the past 2 years. Running back, Joshua Bickham, stepped up in the playoffs last year when our starter went down. He rushed for over 100 yards in 3 straight games to help lead us to the State Semi-finals. They will be surrounded by a bunch of good, young players that are eager to step up.